Start training, start training, I'm going to start training for the upcoming NBOS Run & Ride 2016. NBOS actually stands for National Blue Ocean Strategy, aim to create niche markets in any industries for business growth to help boost the nation's economy. The run organized by MAKSAK Malaysia, will be held on Sunday 14th August 2016 at PICC, Presint 5, Putrajaya. This fun event is supported by Ministry of Youth & Sports, Perbadanan Putrajaya and Persatuan PerkhidmatanTadbir dan Diplomatik. Please note that the eligible age to participate for categories a – g is 16 years and above while participants aged 13 years and above are allowed to participate in the 5km fun run. Free admission for children aged 12 & below. However, parents must take full responsibility and care over their children’s safety. a. 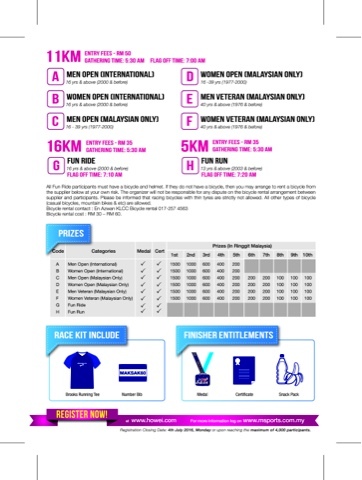 Race pack - participants must collect their race pack from VIVA Home Shopping Mall, which will consist of a BROOKS T-shirt, a number bib, safety pins & race guide (in any). b. A finisher medal, certificate and a snack pack will be given to the participants upon completion of their run or ride. a. Foreigners aged 16 years and above are eligible to take part within Category A & B.
b. Malaysians aged 16 years and above are eligible to take part within Category C, D, E & F. Must possess a blue NRIC. c. Everyone who are aged 16 years and above are eligible to take part within Category G - Fun Ride. d. Everyone who are aged 13 years and above are eligible to take part within Category H – Fun Run. II. 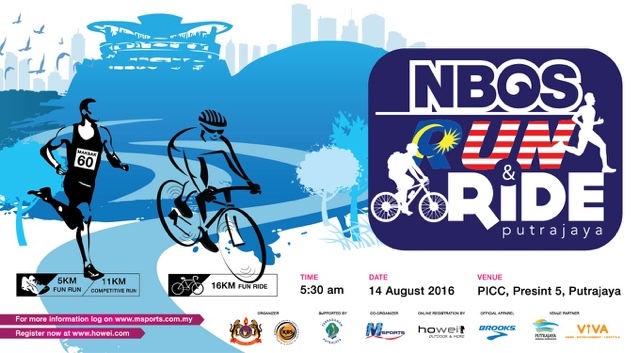 NBOS Run & Ride 2016 shall be conducted under the rules of Malaysian Athletics Federation (MAF) and also a set of competition rules. Age qualification will be taken as of 31st December 2016. III. All Fun Ride participants must have a bicycle and helmet. If they do not have a bicycle, then you may arrange to rent a bicycle from the supplier below at your own risk. The organizer will not be responsible for any dispute on the bicycle rental arrangement between supplier and participants. IIII. Please be informed that racing bicycles with thin tyres are strictly not allowed. All other types of bicycle (casual bicycles, mountain bikes & etc) are allowed. Rental Price​: RM 30 – 60. Anyone who wishes to participate within Fun Ride but doesn’t have a bicycle may opt to contact the person named above to make an arrangement to rent a bicycle or any other supplier deemed suitable. Please note the arrangement for bicycle rental is between the participant and the supplier. Therefore, the organizer will not be responsible for any dispute on the bicycle rental arrangement between the supplier and the participant. Please ensure helmet is provided together with bicycle for participant’s safety during the fun ride. All prize winners must produce their identity card or passport for age verification. Winners must ensure to collect their cash awards after the race and upon announcement of the results. Everyone needs to register via Online Registration at https:event.howei.com/event/nbos-run-ride-2016. i. Any online registration that is not followed with online payment will become invalid registration. Therefore, please ensure to pay online when you register online. ii. No refund will be made for wrongful or multiple registration. iii. Substitution and changing of categories is NOT allowed, so please select the category you’re eligible to sign up according to the age qualification. Otherwise you will have to re-register. iiii. Postal entries are not accepted. v. The decision of the Competition Committee is final when accepting entries. The organizers have the right to refuse an entry without having to disclose a reason. Race pack consists of Brooks Running Tee, a number bib attached with timing chip (timing chip only for 11km), safety pins and race guide (if any). Please be advised that the quantity of the Brooks Running Tees’ ordered according to sizes are limited, therefore the distribution shall be carried out on first-come, first-served basis. Venue​: LG, Viva Home Shopping Mall. Come join me in this fun-filled event. The registration will be closed upon reaching 4000 participants or 23rd July 2016. See you there! Log on to www.msports.com.my for more information.